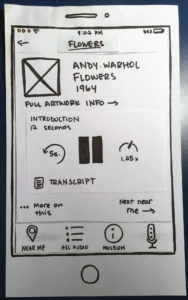 Out Loud is The Andy Warhol Museum’s inclusive audio guide. It delves into the life and art of pop artist Andy Warhol through different stories and a variety of voices, such as scholars, curators, and members of Warhol’s family. 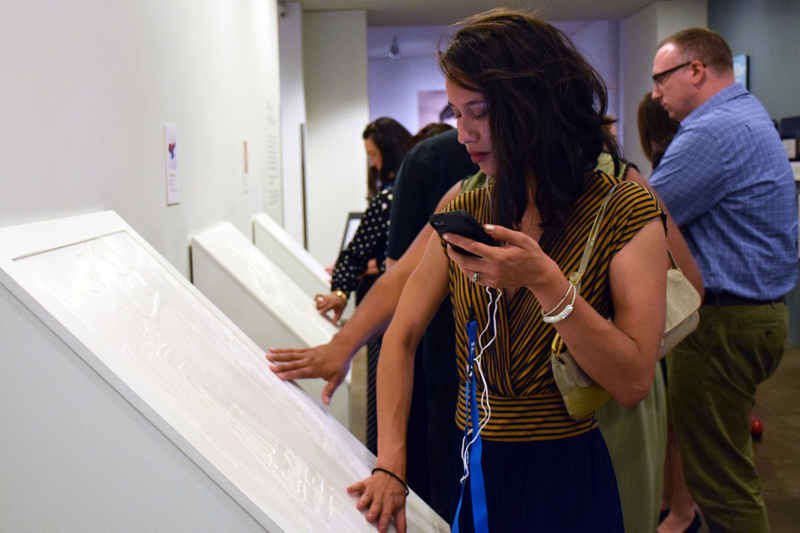 The first audio guide of its kind, Out Loud allows both sighted visitors and visitors with visual impairments to independently enjoy the museum. The audio guide uses bluetooth low-energy beacons to push out content to visitors based on location. 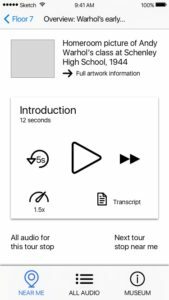 In addition to being optimized for the iOS Voiceover screenreader and dynamic type, Out Loud offers visual descriptions to give a detailed understanding of what an artwork looks like. 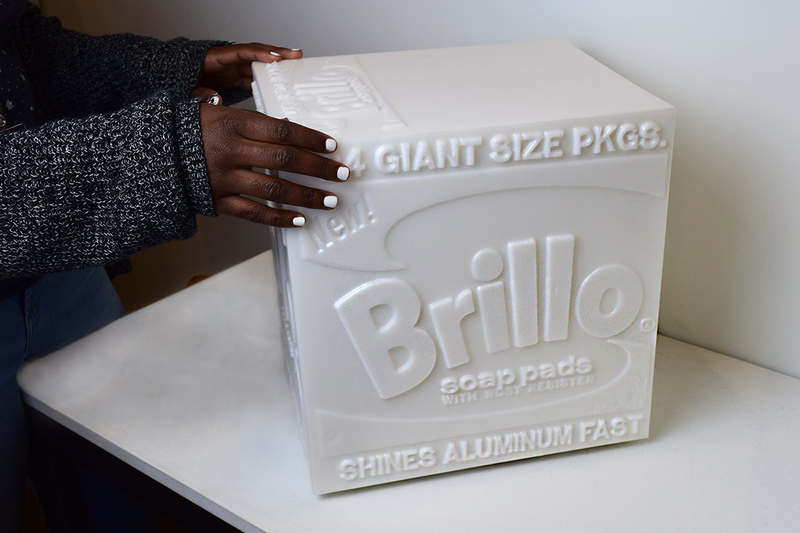 Additionally, Out Loud integrates with our tactile art reproductions, touchable, three-dimensional reproductions of signature works in The Warhol’s collection installed throughout the museum. I spearheaded the development of this project from conceptualization to launch. 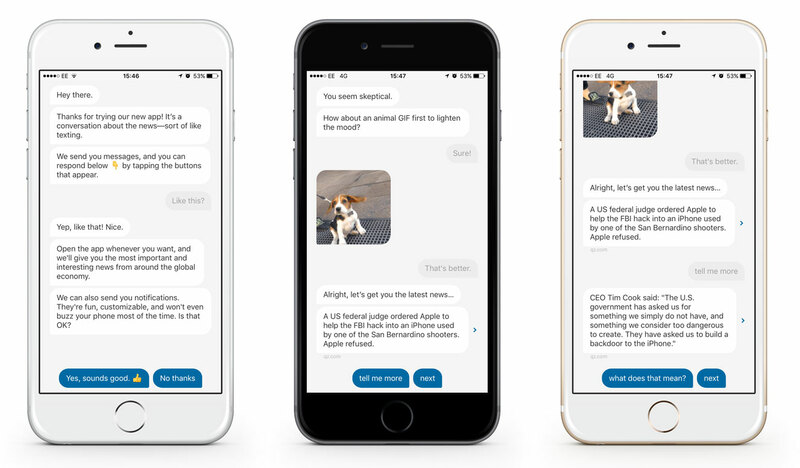 In the role as project manager and user experience lead, I worked with a team of two developers and two content specialists to conduct user research, design prototypes, develop content, and ultimately oversee the development of an iOS app. Art museums have historically been places that exclude or ignore the needs of people with visual impairments. To develop Out Loud, we knew we needed to take an iterative, human-centered approach, working closely with community members with varying visual impairments through out the conceptualization, design, and testing process. Extensive interviews and secondary research informed the development of five design principles that we carried through the entire design process. In designing Out Loud, we were determined not to silo accessible content apart from other educational content. Instead of creating “a thing about disability,” we hoped the audio guide would be a seamless, inclusive educational experience regardless of a user’s ability. 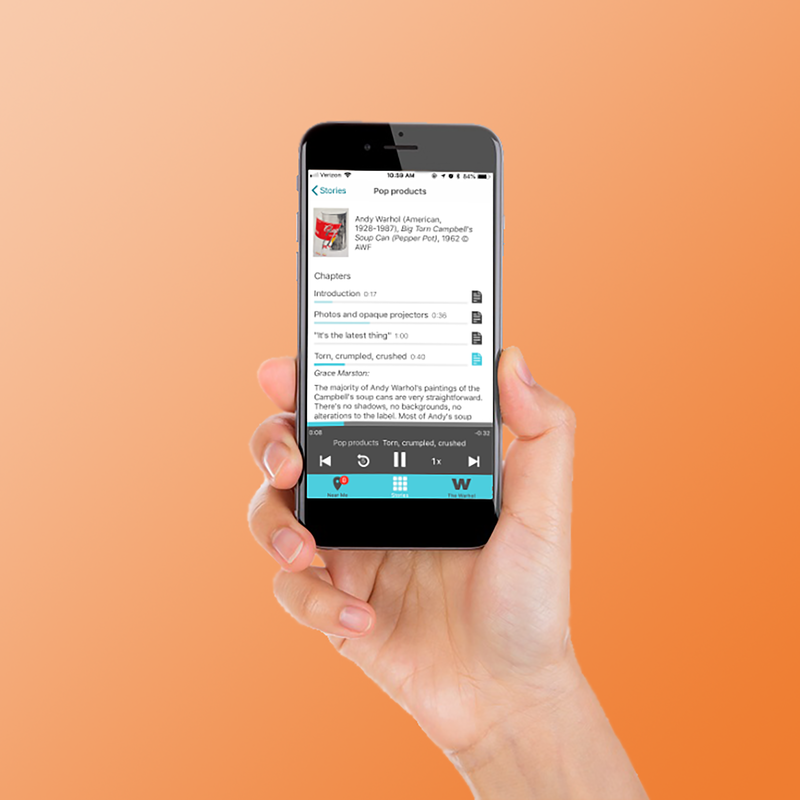 In order to achieve this seamless experience, we had to redesign the traditional audio guide. The result was a “learning player” that breaks content into smaller, modular audio files (called “chapters”), allowing visitors to dive deeper if they’d like to learn more—and allowing us to reorder content based on user interests and needs. We iterated through a number of designs before landing on the final design. 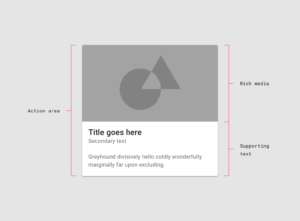 Early on, we found inspiration in two places: “card”-based interaction design popularized by Google’s Material Design, and the Quartz news app, which reveals small chunks of content through a chat-like interface. We A/B tested the card-based and Quartz-inspired designs, asking user testers to interact with each design and then compare the experiences. Reception to both was mixed. 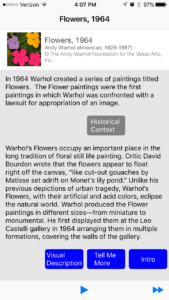 Users enjoyed the concept of the modular audio content that allowed them to delve deeper into Warhol’s life and art. However, they felt that the audio guide provided too much of a path and not enough of a choice: they never could see an overview of all of the available audio content. Additionally, on both prototypes, actionable buttons changed location on the screen from chapter to chapter, which was a confusing experience for users with visual impairments who are attempting to get a handle on a new interface. We knew we’d have to give up on the idea of the “slow reveal” of our modular audio chapters in favor of surfacing all of the available content at once. We ultimately settled on a design that listed all available chapters on one screen. A user can scan the list of chapters and select what he or she wanted to listen to. The title of the chapter simultaneously serves as a button that plays the audio and a progress bar that visually indicates how much of the audio had played.